From ancient times, people have used to decorate their house with statues. Statues were either the part of some religious belief or the work of excellent craftsmanship. From old days, people used the Ganesh statues in their homes and temples for worshipping. The statue has also found a place in decoration of the house interior. According to the Hindu mythology, the Ganesh God represents the power, which removes all the obstacles in the path of the human. He ensures the success of the human beings who worship him. People also carried the statue with them on their journey in order to remain safe. The elephant faced Ganesh is the son of the Lord Vishnu. People of Hindu belief celebrate Ganesh chaturthi in his honor. You can present the Ganesh statue to your beloved ones as it comes in various sizes and shapes. The statues also come in various materials like gold, steel, silver, wood, and stone. The design of these statues also differs from one another. As the people believe the statue to ease the travel, this gift will show your care for your guest. As the statue comes in various sizes, you can choose the best size to implement in your house. It fits well in your house space and gives the space an eye-catching look. No one can fail to notice the presence of this marvelous statue in your house. It fulfills both the need of worshipping and decoration. You can select the big models of the statue to decorate your garden too. Gardens look stunning with the assimilation of stone statues. Ganesh statue along with a chowki and a small decorative box can create magic in the decoration of the house interior. The smaller statues look good near the widow and in the balcony. You can also place them in the prescribed temple place in your house. These statues look magnificent on the windowpane, which gives a look of the green vegetation. 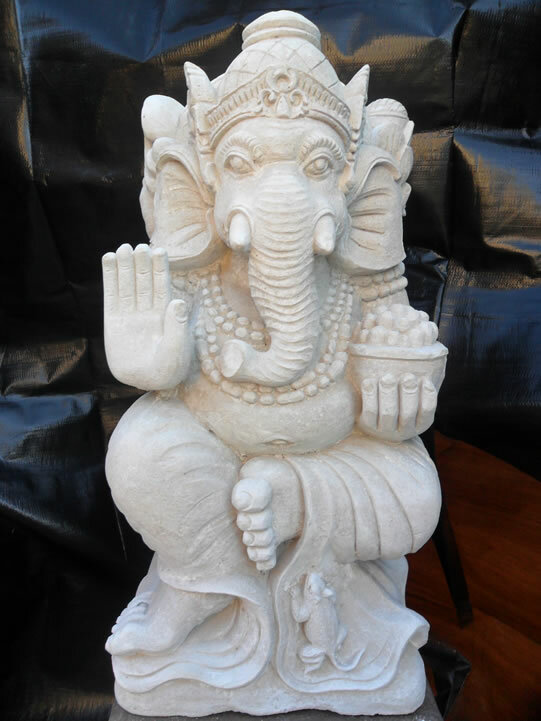 The Ganesh statue made with the white limestone looks very realistic.